Well this week did n't really go to plan. I always plan to do more than is possible in any given time, but this week I achieved almost none of it! The wallpaper in the dining room is still on the walls and no painting in the dining room has been done and the wood work in the hallway remains as dingy as it ever was...and there has been very little sewing. I recall studying Jane Eyre at school and being told that the storms reflected the emotions of the character(s) in the book and that this is called 'pathetic fallacy'. It's been like that for me this week (although google advises that pathetic fallacy is actually inanimate objects or nature actually having human emotions, which is a very inconvenient truth). Anyway the point is I have had a really grotty cold and cough all week while the weather has been throwing rain and gale force winds at us. I was too ill to go to my singing lesson - I cancel so many lessons for throat and chest infections, it amazes me Kelly is still prepared to teach me (I confess to shamelessly bribing her with homemade marmalade in addition to the cost of the lesson). I did n't get over to Chepstow to visit my sister while my niece was staying with her, and I missed an all day rehearsal for Bach's St John's Passion. I am a self-taught musician and my sight-reading and timing leave something to be desired and this piece is quite putting me off Bach! The point is I really need the practice. I used to sing soprano, but I am really more of a mezzo so now sing alto, and it's very hard not having the tune. At least I did manage to enjoy our street party in honour of the Queen's diamond jubilee. I live in a lovely quiet cul-de-sac of 1930s houses. There is quite a good community spirit and we have a Christmas street party every year, where we take sausages for the barbecue and sing carols around a brazier and someone dresses up as Santa to hand out presents to the kids. One year it even snowed as we were singing. This was the first Summer street party I have been to and it was nice to have a get together when it was daylight - it was amazing how many people said they did n't know people's names as it was always dark when they were introduced at the Christmas do. Personally I have such a bad memory for names, it makes little difference. My cake went down a treat and we all ate and drank and chatted happily all afternoon. So very English I think. It was after the street party that I succumbed to the cold and cough. The only thing I managed to do all week was to put together a photo-book. An online digital imaging company (can I say it was Photobox?) celebrated it's 12th birthday, I think, by offering a huge discount to buy a credit for a 100 page book, so I took advantage of the offer. We are fortunate to have a tiny holiday flat in Dorset and I wanted to put together a book of photos of my favourite places to go. We let friends and family use the flat, and I thought it would be nice to leave the book in the flat to give people ideas of places to visit. it took hours and hours to choose the photos and arrange the pages, but I think I've done it - just one more proof-read and I will order it. 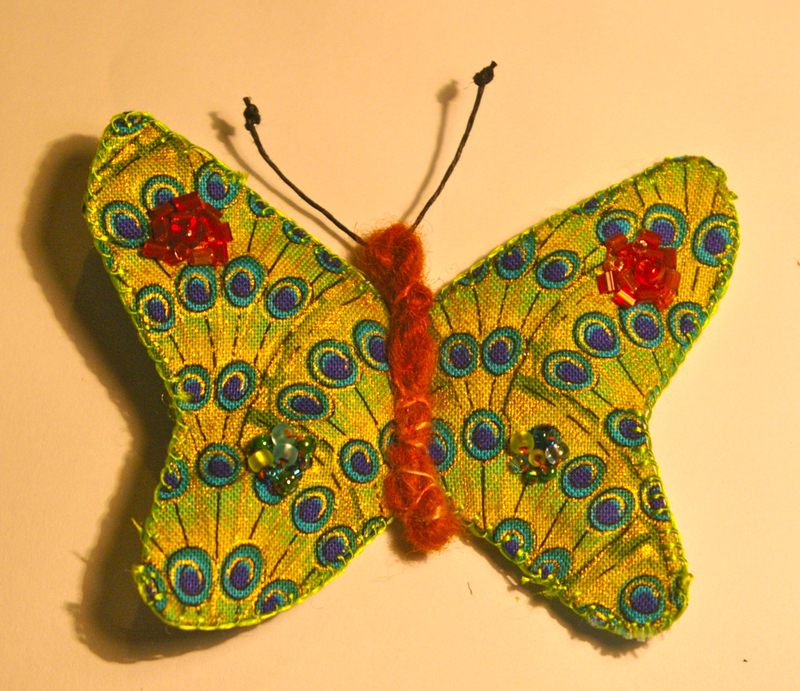 I think it works better, but still needs some tweaking (a different quilting stitch and wing shape perhaps). It's a work in progress; I have to keep reminding myself that my days off 'proper' work is meant to be a time is for fine tuning my products, and I can't expect them to be perfect straight off. I think the butterflies would look better in a longer frame with a number of different butterflies together. Perhaps I need to be brave and have a go at making my own frames. I don't usually work with hard media like wood - the hardest material I have used is gingerbread when I left out the baking powder! I love the butterflies Sue! my only suggestion would be to try darker frames with light colored Butterflies and the lighter frames with darker ones.... but if you add these to your shop, I bet you will have requests for all shapes sizes and color combos! Thanks Karin - that's a really good idea. 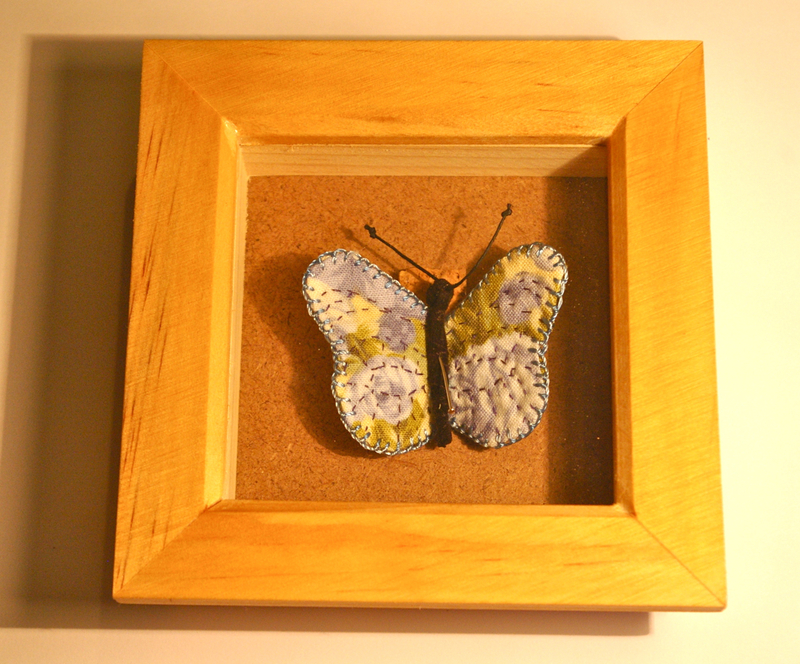 I have a white frame I intend to put 4 butterflies in to and I will try it with dark fabrics.